Prepare to be inundated by pumpkin recipes. I love pumpkin. Bread pudding is usually a super indulgent dessert-like “breakfast” item but since I don’t like eating 6,000 calories for breakfast, I lightened it up a bit. I started with this recipe from Epicurious then replaced the half and half with regular milk. 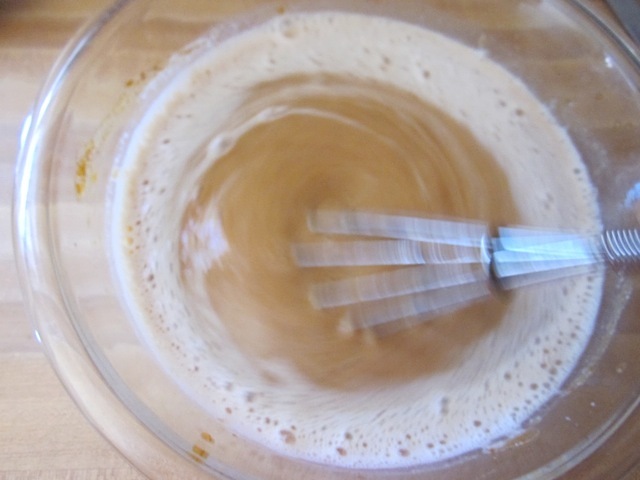 Second, instead of making a super rich caramel sauce to drizzle over top, I left mine plain so that I could top it with a scoop of low-fat yogurt or simply some maple syrup. If you want to be fancy-schmancy, you can use some whipped topping and then drizzle it with maple syrup. Or, just make the caramel sauce from the original recipe. Some chopped pecans would also be amazing in there, if you have some. 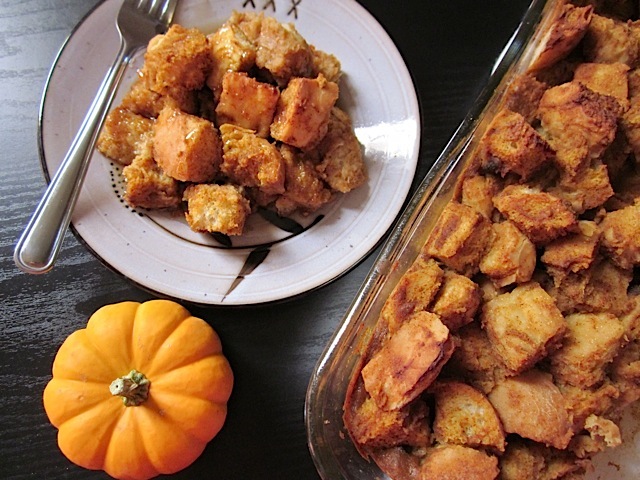 There's nothing better on a chilly autumn morning than this rich, pumpkin flavored bread pudding! Cut a day old loaf of french bread into one-inch chunks. 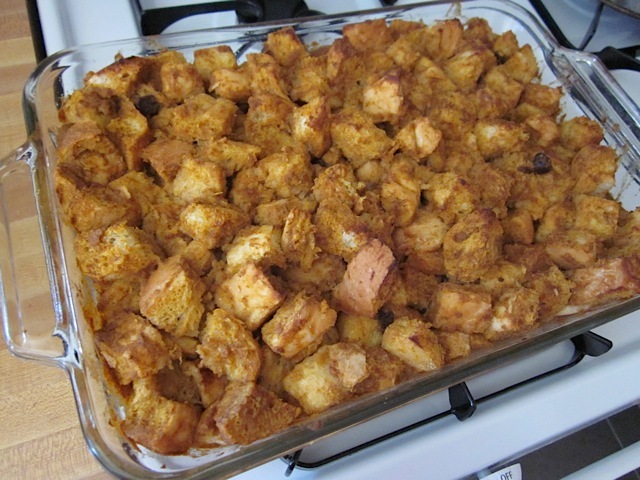 Place the chunks in a large glass casserole dish that has been coated in non-stick spray. Sprinkle with raisins. 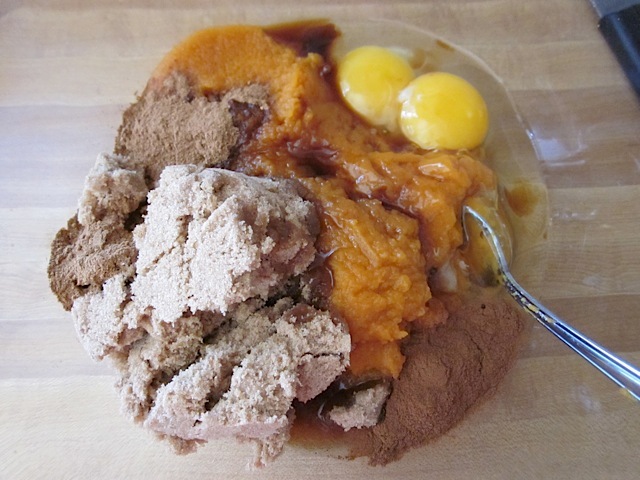 In a bowl combine the pumpkin puree, eggs, brown sugar, cinnamon, pumpkin pie spice and vanilla. Stir until evenly combined. Whisk in the milk. 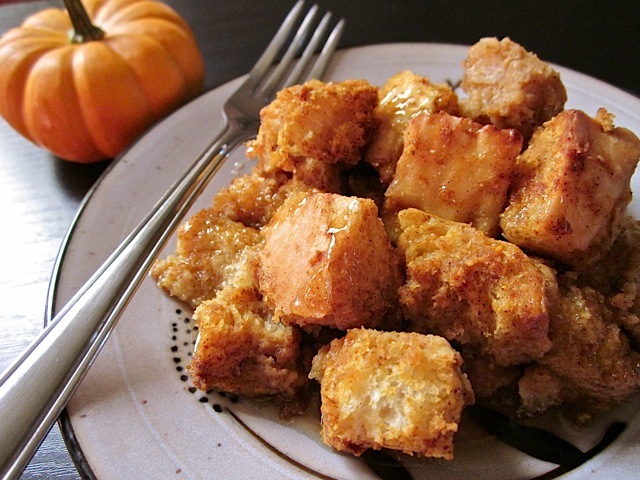 Pour the pumpkin/milk mix over the bread cubes and give it a gentle stir to coat the cubes. Preheat the oven to 350 degrees. Let the bread cubes soak in the pumpkin mix as the oven heats. 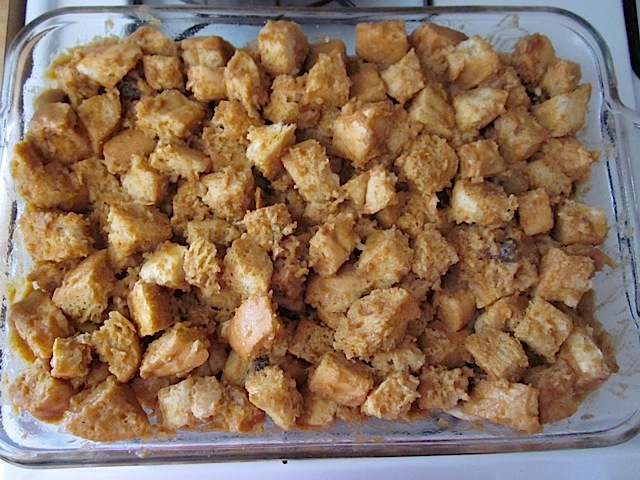 Bake the bread pudding for 40-45 minutes or until the center has set (poke with a toothpick, it should come out clean). Serve with maple syrup, whipped cream, vanilla yogurt or caramel sauce. 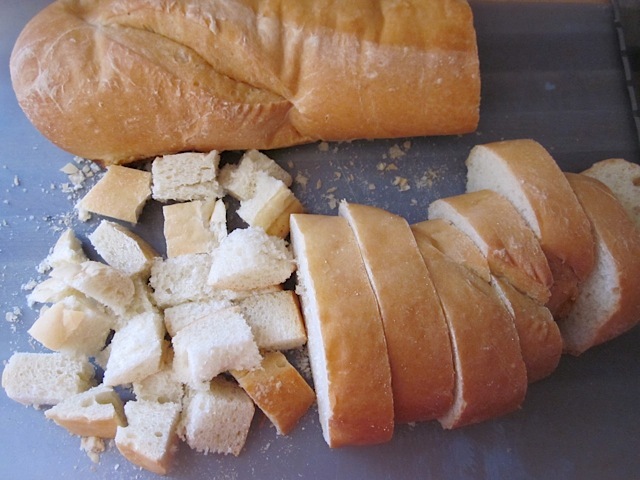 Cut a large loaf of french bread in to one inch cubes. Stale bread works best. 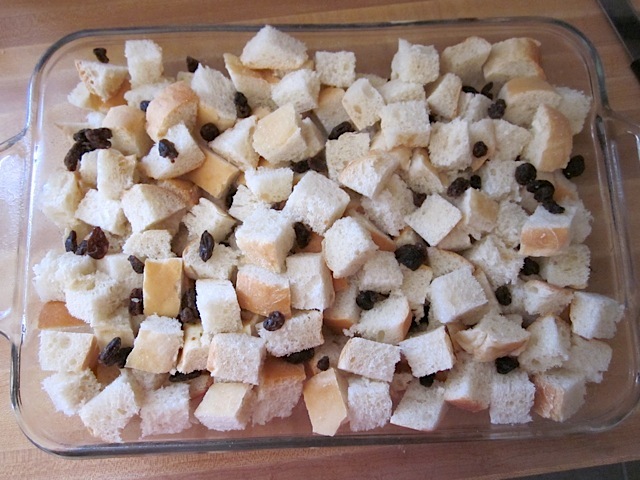 Place the bread cubes in a large casserole dish coated with non-stick spray. Sprinkle on the raisins. Begin to make the pumpkin custard by combining the pumpkin puree, brown sugar, eggs, cinnamon, pumpkin pie spice and vanilla. Mix well. Then whisk in the milk. ACTION SHOT! Pour the custard over the bread cubes. I used a measuring cup and did it one cup at a time to make it more even. The custard will still pool on the bottom leaving pockets of dry bread so you will need to gently stir the mixture to evenly coat the cubes. If you use a fork, it will probably break up your bread cubes like mine :( I should have used a spatula. Preheat your oven at this point and let the pudding soak up into the bread as the oven heats. 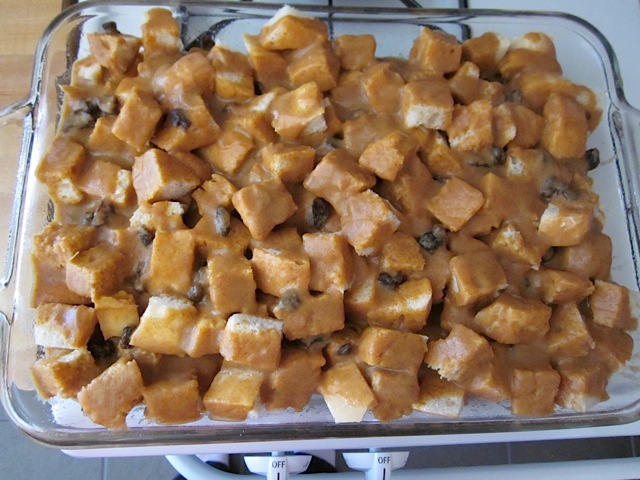 Bake the bread pudding for 40-45 minutes or until it has “set”. Use a toothpick to see if the center is cooked, it should come out clean rather than covered in goo. This dessert/breakfast is a great alternative to pumpkin pie for the holidays. 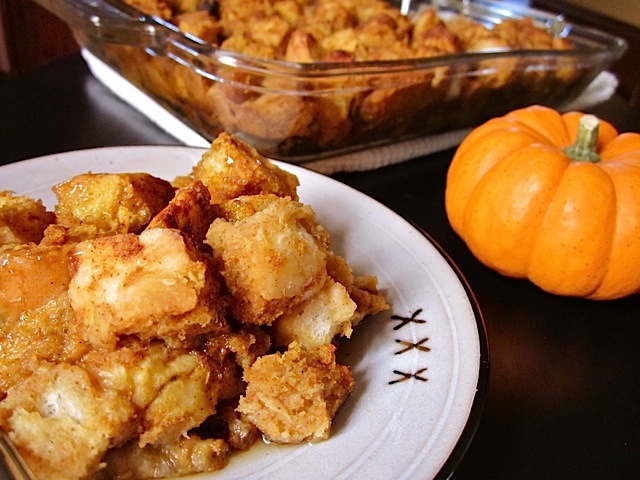 Both pumpkin pie and this bread pudding make use of a pumpkin custard. 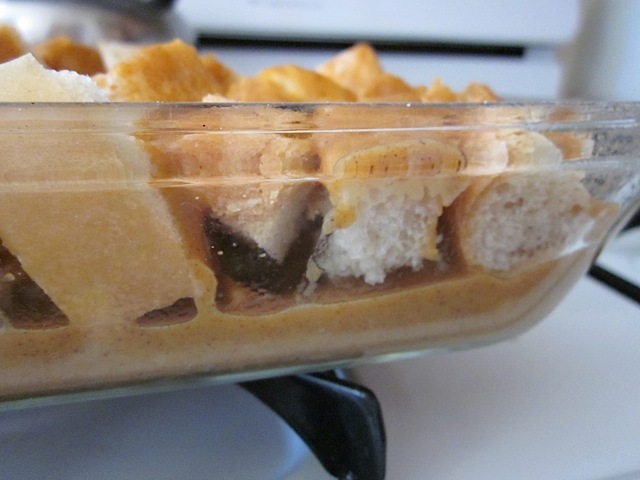 While the pie uses a high fat pie crust, the bread pudding uses french bread. If you can find wheat french bread, even better! Just made this for breakfast, and it was delicious! Made the house smell amazing.